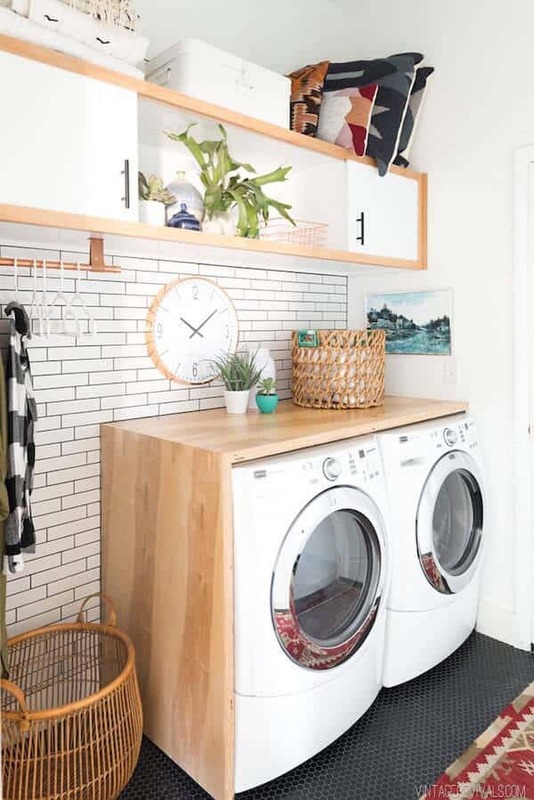 Whether you have one child or a whole host of little ones, it is almost inevitable that your house will be taken over by toys, books, clothes, and countless art supplies at some time. 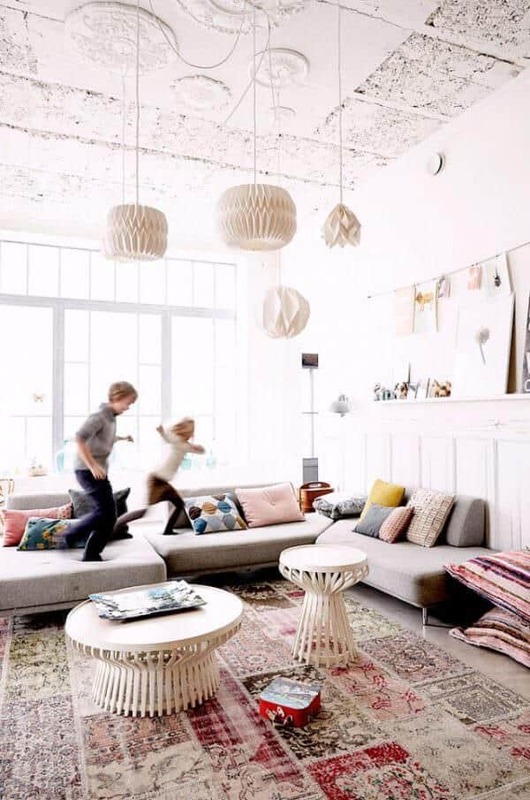 Most of us try to combat the mess by sequestering our kids’ playtime to one or two rooms in the house. Other parents, however, embrace the mess in a super cool way. Instead of hiding all signs of tiny life, they incorporate play and lounge space for their little ones in really cool ways. All of these living rooms are fun, stylish, and kid-friendly all at once! 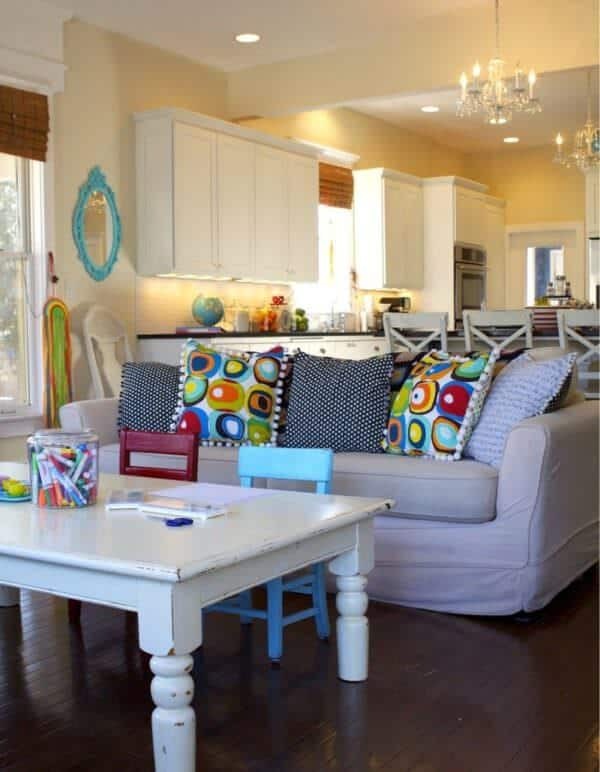 Not only are the bright pops of color in this living room super fun, but the coffee table turned kids table is a great addition to the space. The kids’ play and workspace is perfectly incorporated into the room without seeming out of place, whether they are doing homework or arts and crafts, they get to feel completely free and at home in this living room. 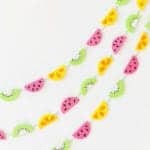 Find fun crafts and creative ideas at Meg Duerksen. Toys accumulate super fast, which makes finding adequate storage super hard. This simple but effective storage solution also just so happens to blend in perfectly with the rest of the living room. 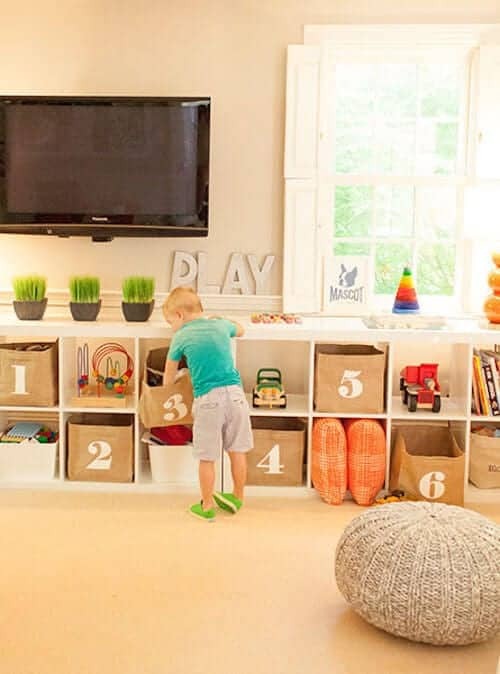 The white shelving is super simple and the numbered boxes and colorful little toys and items on the shelves add a fun, playful vibe that is perfect for kids. Find more amazing home design inspirations at Delicious Designs. 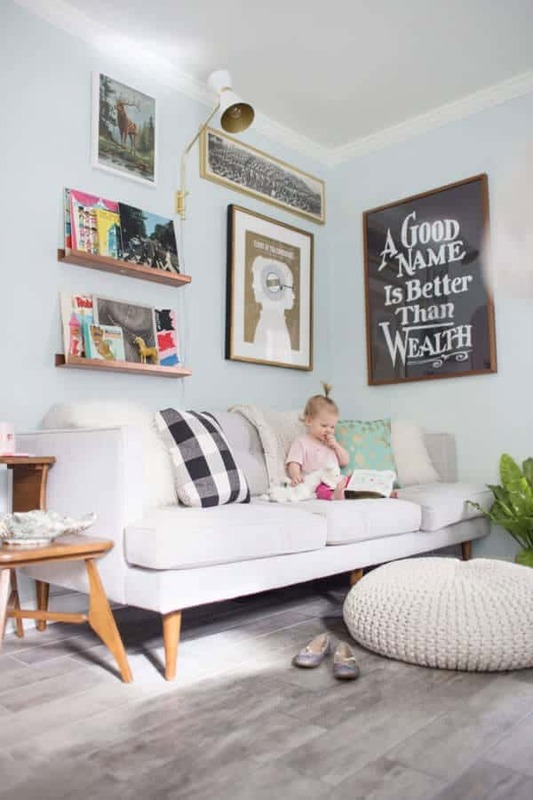 This artsy family perfectly blends there more sophisticated art prints and items with their daughter’s favorite books in this cozy little den. The neutral colors are super calming and the furniture is simple and comfortable. No hard edges or expensive baubles for the little one to break or hurt herself on. 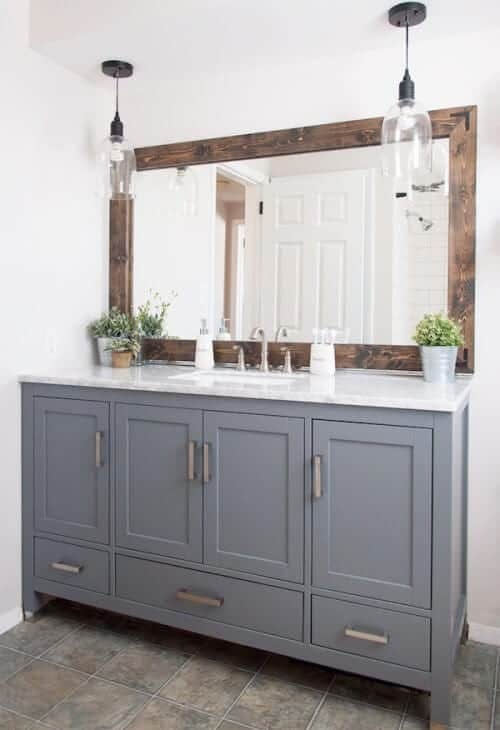 Head over to Lay Baby Lay to find more home design inspo and great DIY ideas. This family obviously loves to read, that much is clear by their entire wall of bookshelves. 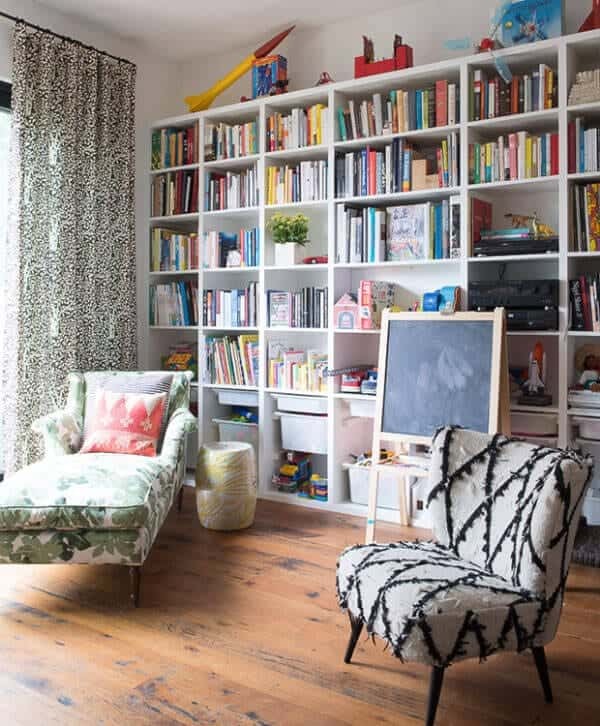 While this living room isn’t fully decked out in toys, it is obvious that it is used as a space for the kids, and the entire family, to read, relax, and create. Get great recipes, decor inspiration, and more at House & Home. This living room is the epitome of comfortable. The simple little couch is surrounded by big fluffy poofs and pillows that are perfect for nap and quiet time. There is also plenty of room in the area behind for the kids to play with their toys, do school work, and generally hang out. 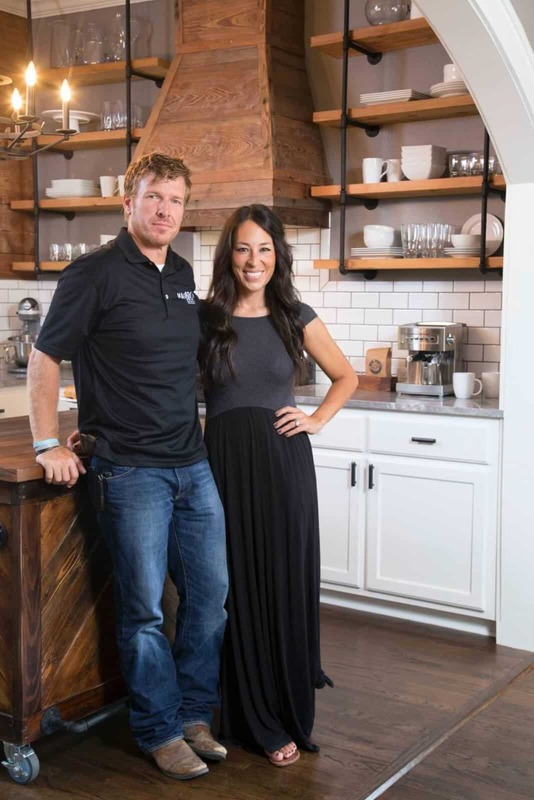 See home design inspiration and plenty of blue at House of Turquoise. Talk about going all in! 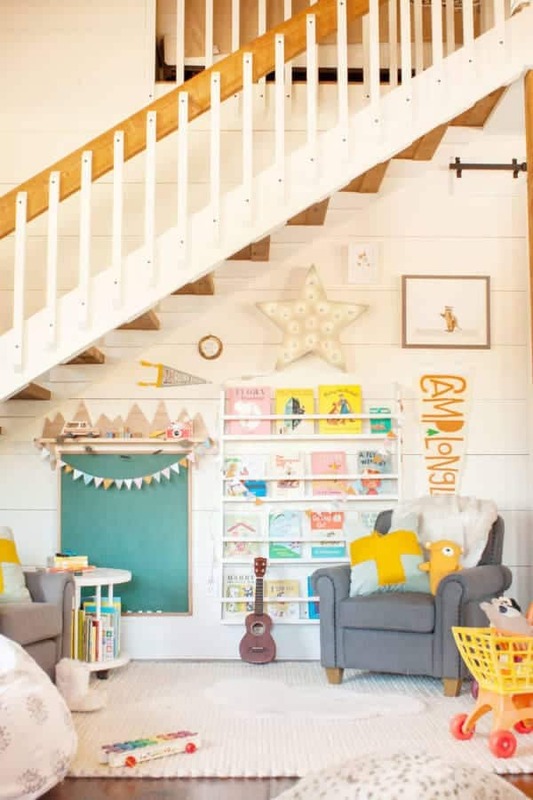 This family room doubles as a playroom under the stairs. 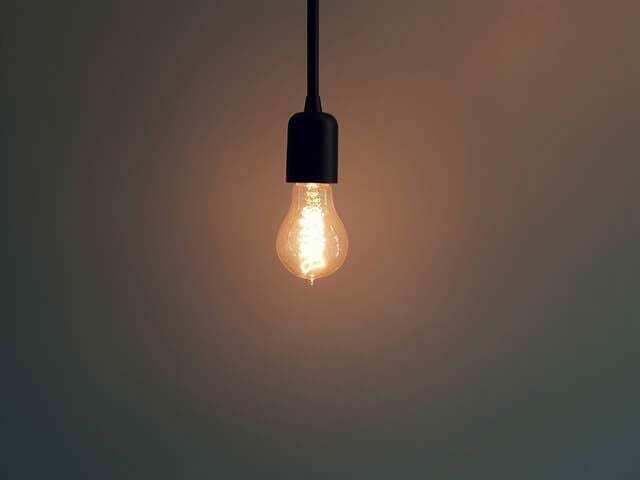 This is a great idea both for lack of space and as a way to keep an eye on your kids. 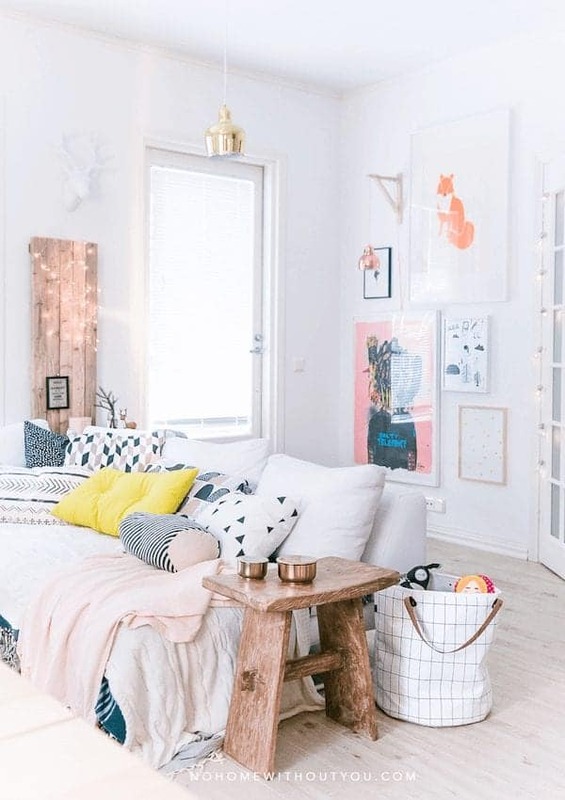 By using small pops of color and keeping the play furniture and items trendy, the little space is super fun and fits in perfectly with the rest of the design. 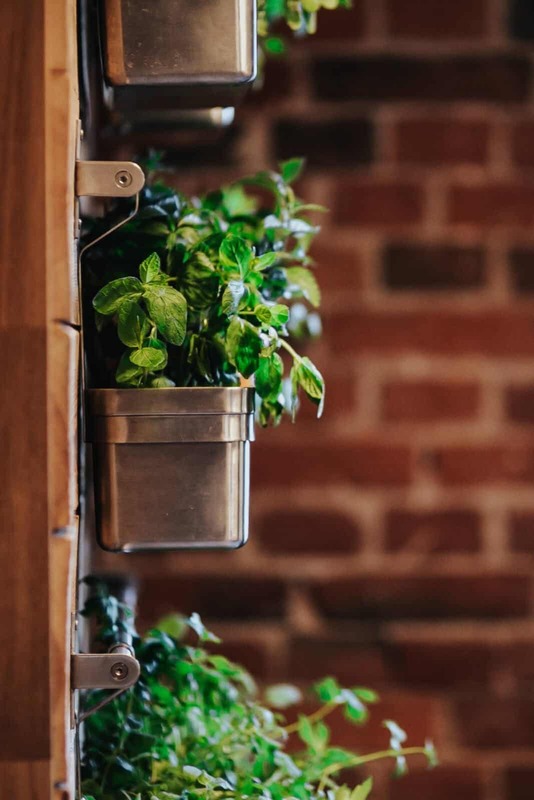 Get more cool ideas for kid-friendly activities and design at Lay Baby Lay. 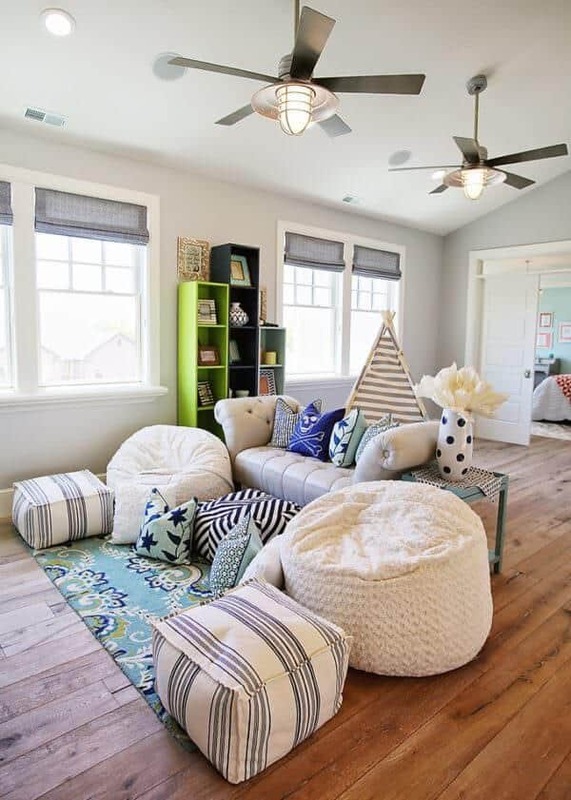 Beach houses are supposed to be serene and relaxing, this space manages that even with a kid-friendly living room. The additions are definitely small, proving that the kids may not spend all of their free time in the living room, but when they do, they are outfitted with their own little matching teepee and comfortable chair. Glamour is full of celebrity news, beauty tips, and mom tips. This living room isn’t outfitted with tons of toys, little tables, or children’s books, but it is still a great space for kids. The comfortable, study couch is great for sitting (and jumping) and the tables are a great homework space. Nothing in this living room looks breakable or uncomfortable. Find plenty of design inspiration at MILK Decoration.